The protest culminated at the faculty assembly in the Bill Bordy Theater. The protest began in the Boylston Place alley. 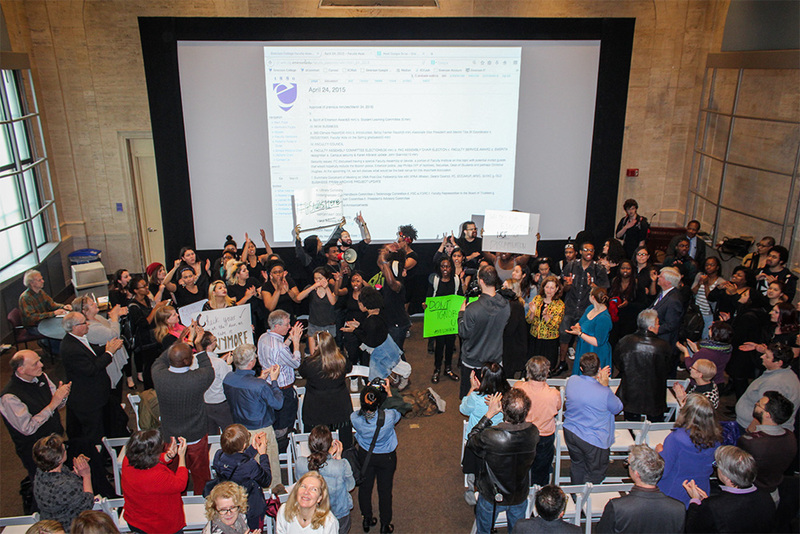 Several hundred students demanded campuswide cultural competency and sensitivity classes in an impassioned rally that led protesters from the halls of the Walker Building—chanting, “We pay for education, not discrimination”—to a faculty meeting in the Bill Bordy Theater. Marchers packed the Bordy, taking over a monthly forum for professors, and about a dozen students gave emotional speeches about their personal experiences facing racism at Emerson, calling on the community to pay attention to their voices and humanity. President M. Lee Pelton was the last to speak, and pledged to continue the conversation afterward. “We would like to see the sociopolitical issues occurring outside the classroom acknowledged and respected within the academic environment,” Alexandria Ellison wrote on a Facebook event for the demonstration. The protest began around 1:30 p.m. as students, many donning all black clothing, streamed out of Emerson’s academic buildings and gathered in the Boylston Place alley. The protesters were met with a standing ovation from professors as they entered the Bordy, still chanting and holding signs reading “Don’t ignore us any longer” and “#ItStartsHere.” One by one, students stood in front of the projection screen that displayed the faculty meeting’s intended agenda, speaking into a megaphone to tell their stories. “Emerson College broke me. I have never been broken. Y’all broke my spirit,” said Alyssandra Taylor, who said she was a sophomore but left Emerson this semester. Sophomore Sheba Wood told professors that they were holding their students back. “Students, how many of you support cultural competency training for faculty?” asked Wood, the Student Government Association multicultural commissioner. The crowd vigorously cheered in support. The event took place a day after students took to the the dining hall to protest the college’s handling of race-related issues at the college, asking for changes from their classmates and professors. Hantzley Audate, a sophomore marketing communication major, said that students needed to make a difference at the school, and needed to apply the same treatment to everyone at Emerson. Audate declined to comment for this article. The event ended with a chant of “It starts here”—a call to action seeking change from the college. In recent campuswide survey organized by administrators, students faulted the college for having an inadequately diverse faculty and staff. Fifty-four percent of student respondents said Emerson places “sufficient emphasis” on having diverse employees, compared to 70 percent of faculty and staff respondents. The survey also found sharp racial divides in whether students believed Emerson respected them. Across all racial and ethnic groups, 61 percent of students said that they felt a sense of belonging at Emerson, but only 42 percent of students identifying as black or African-American did. Overall, 60 percent of students said they believed Emerson valued people of diverse backgrounds and cultures, but among black or African-American students, only 34 percent concurred. On Tuesday, Penelope de la Rosa, a sophomore performing arts major, received a standing ovation in the Bordy after recounting how she was heartened by one professor who she said paid attention to what his students were feeling. Sophomore Xia Rondeau told the crowd that this demonstration was not meant as an attack, but was an effort to galvanize students and faculty and spur changes. To conclude the demonstration, junior Taylor Jett read the protesters’ mission statement—to have Emerson require cultural competency and sensitivity classes for students and professors. “Faculty, we’re going to need your help,” said Jett, a visual and media arts major, and co-president of Emerson's Black Organization with Natural Interests, or EBONI. In an interview with the Beacon, Pelton said any changes in curriculum would need to be approved by professors. At the meeting, Claire Andrade Watkins, a visual and media arts professor and the chair of the faculty assembly, said this topic would be addressed at the next faculty meeting in August. Andrade Watkins and Michaele Whelan, the chief academic officer, declined to comment for this article. Pelton, in his remarks to the Bordy, called the demonstration a “moment of extraordinary courage” by students. He read a resolution that he had been writing during the student speeches, which the professors then approved unanimously.